Science Relay is a new addon that allows for the transmission of science data between two vessels. A new button has been added to the stock experiment results window that will open a popup with all vessels in contact with the current vessel (or all vessels if you aren't using CommNet). For experiments with less than 100% data transmission a comm boost value will be calculated for each potential target vessel, this won't necessarily match the value shown in the stock window, which is for transmission to Kerbin. Also, this addon allows for direct communication between two vessels without relay antennas, something that stock KSP does not model to my knowledge. This means that the connections available won't match those shown in the map view; anything in direct contact with the current vessel, or any vessel connected to the current vessel through relays is a potential receiver. The amount of data transmitted will be reduced to the transmission percentage level, so an experiment with 10 Data, such as the Goo experiment shown above, will only transmit 10 * transmission %, so 4.2 Data to the vessels in the list above. Once the data is received its transmission level is set to 100%, so if you want to transmit the data again or send it to the KSC you will get the proper value (52.9 science points for the Goo from Laythe). 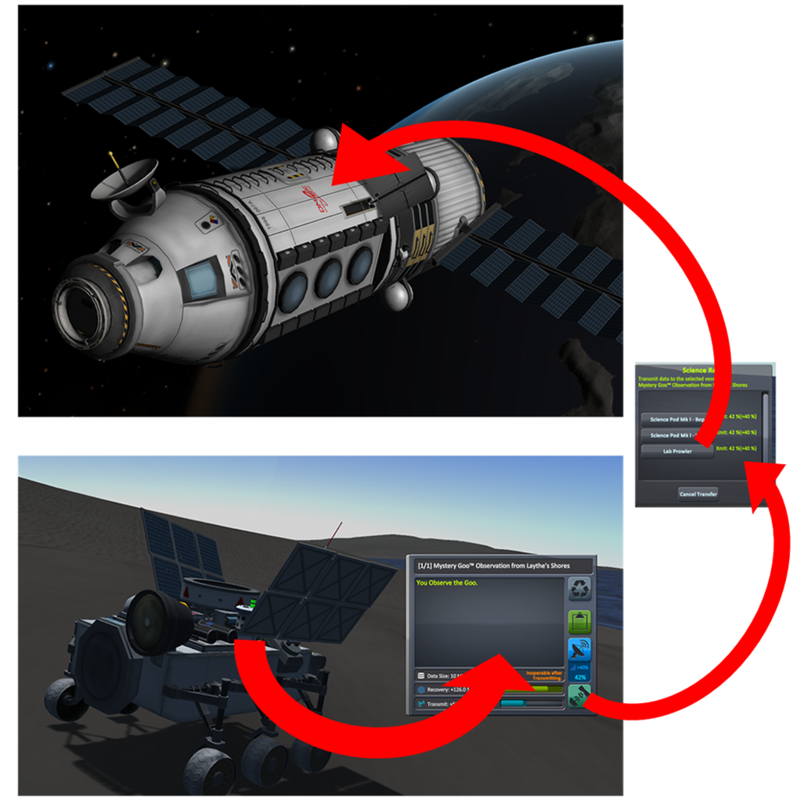 There are options in the difficulty menu that allow for requiring a science lab (only stock science lab modules count) for transmission (otherwise only a ModuleScienceContainer is required), or just for the transmission boost. You can also turn off the transmission boost, or adjust its value down.